This candid photo came about when the local barber perfectly lined up his traditional cut-throat razor on just the right angle. 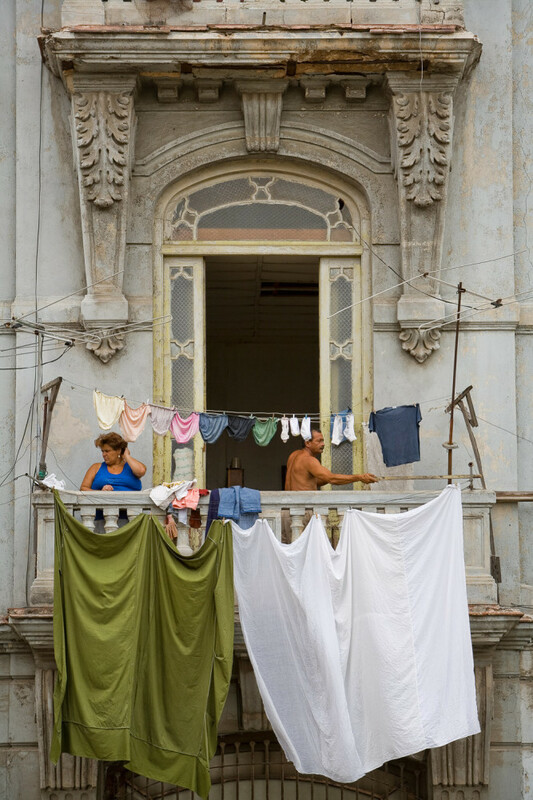 The beautiful duck-egg blue walls are also a common sight across Havana. 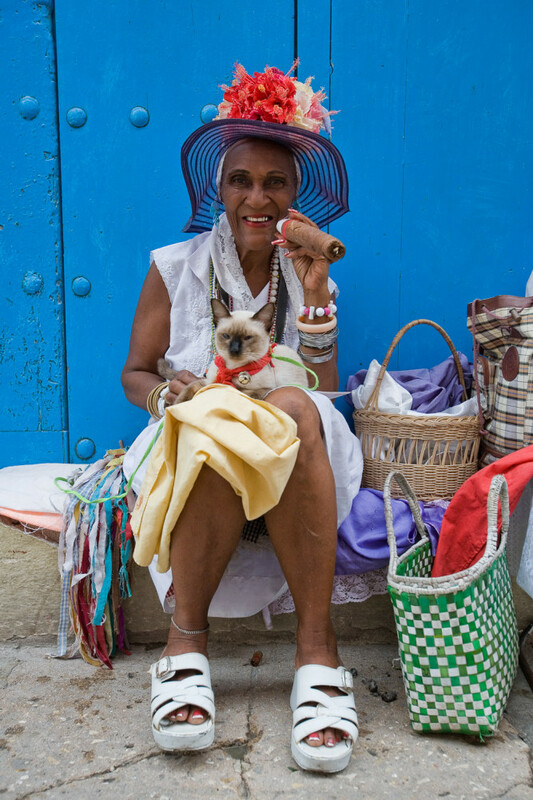 This scene was candidly captured on a hot afternoon in the old city of Havana. Baseball itself is huge in Cuba and a number of top base baller players in the States are of Cuban heritage. But if there isn’t a bat and ball available for an afternoon game, it seems any stick and soda will do. 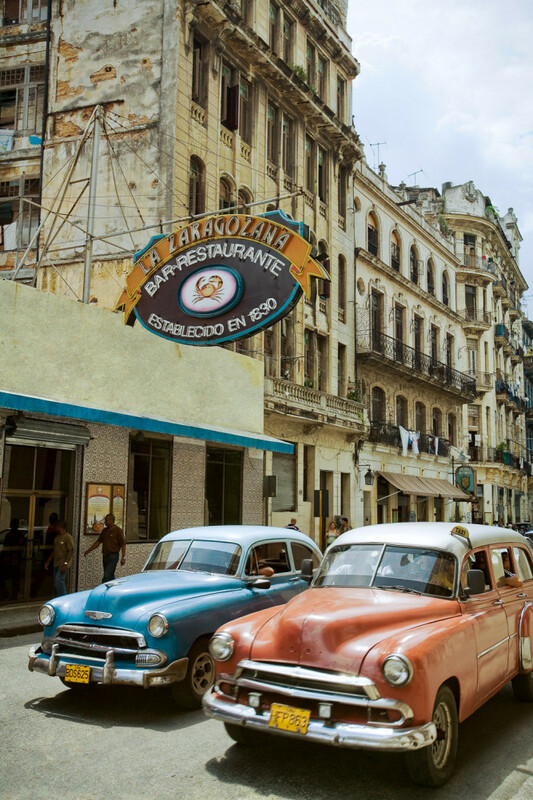 Old Havana also known as ‘Habana Vieja’ has been World Heritage listed with UNESCO since 1982 and with good reason. The crumbling architecture and the scale of these beautiful buildings have to be seen to be believed – and families still routinely live in these palatial apartments. The size of the French doors gives an idea of the ceiling height inside. This woman is part of a tourist sideshow, but the riot of colour and the terribly ill-fitting sandals made it an irresistible photo opportunity. 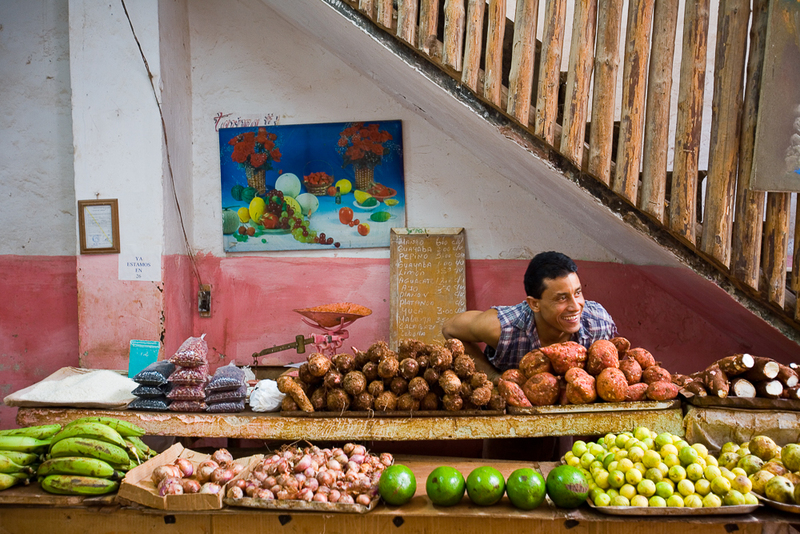 The pastel colours and lovely lines of this fruit stall make this structurally a good photo, but it is really set off by the wide smile of the vendor. Although there’s not a huge choice of produce, he still very proud. There’s a total lack of any junk food and US-style advertising across Cuba which is so refreshing. 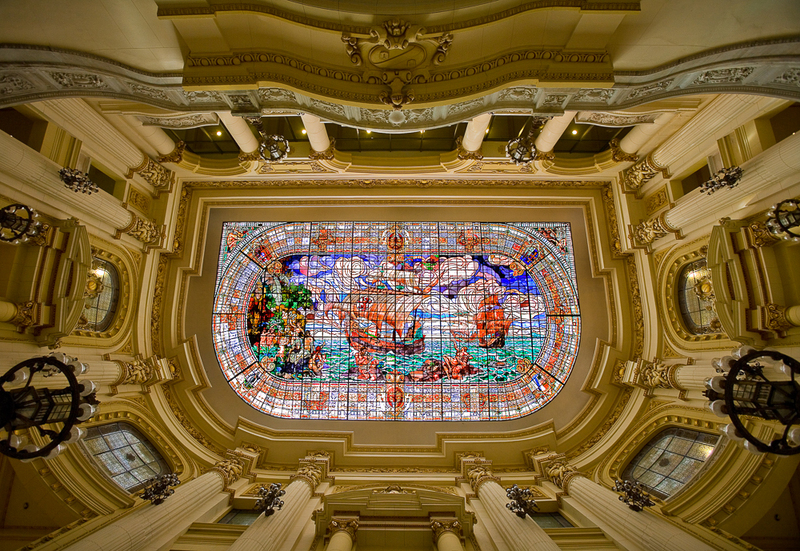 This stunning glass ceiling depicts the landing of Columbus in the National Museum of Beautiful Arts of Cuba or Palacio del Centro Asturiano. 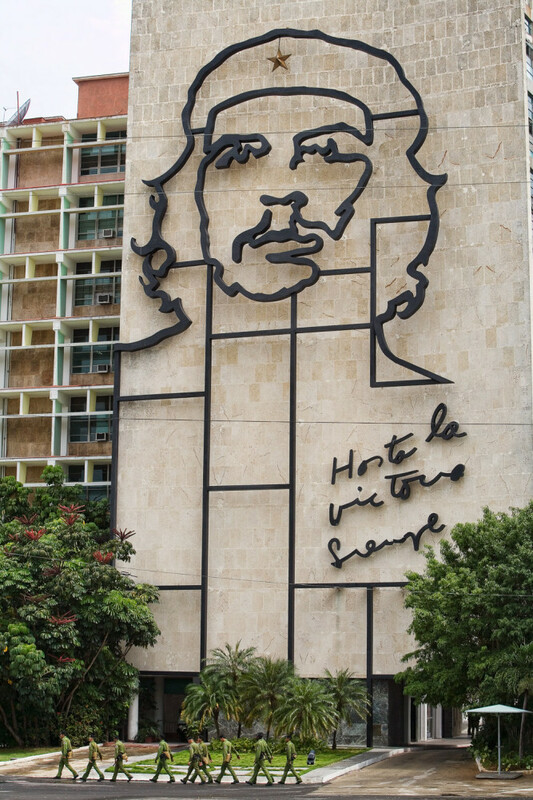 This beautiful building houses amazing works by prominent Cuban artists and includes amazing contemporary art as well. 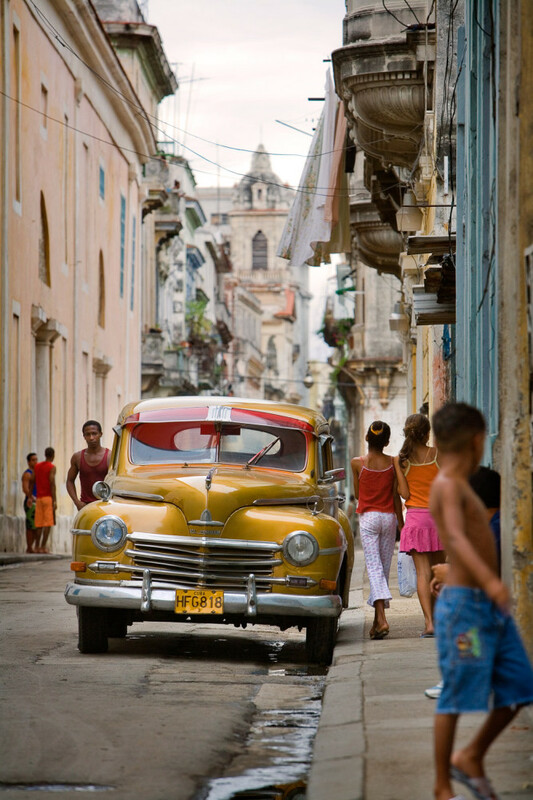 The ubiquitous American jalopy or 1950s automobile still ply the streets of Havana and have become a permanent fixture in the city’s landscape. The streets almost look like a vintage movie set. It’s an absolute must to travel in a taxi here because there are few places on earth that offer this kind of authentic ride. 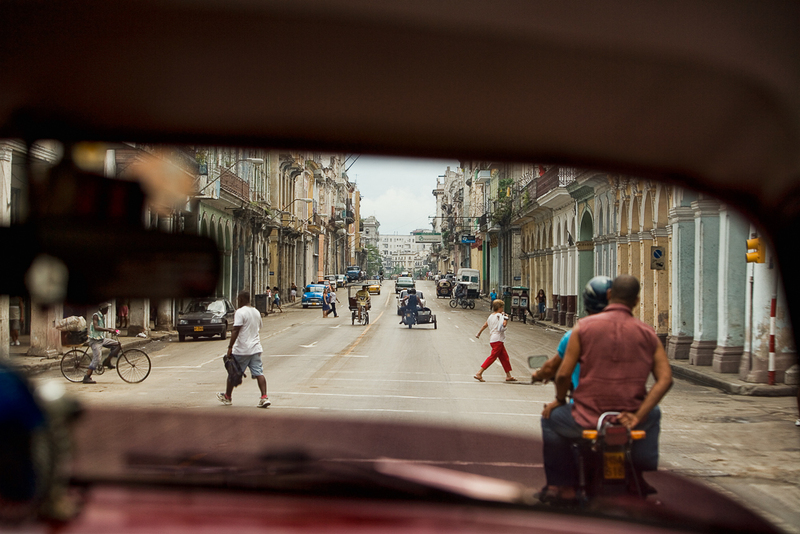 This image is a bouncy front-seat view, highlighting the wide streets and local people going about their daily lives. These old-model cars have been driven almost everyday for 40 years. They congregate in a few places across the city, which is great if you want a good selection to admire. Old Havana is a maze of alleys and crumbling glories from another time – the washed out colours, the textures and patinas are a photographer’s dream. Throw in the city’s vintage cars and you can’t go wrong. With recent changes to US sanctions and trade agreements with Cuba, this Caribbean island is set to see some major changes over the coming years. 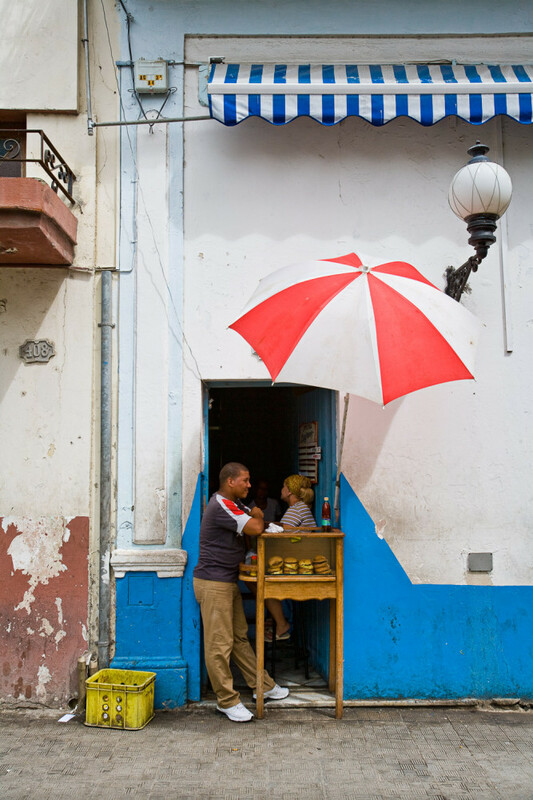 Here, multi-award-winning photographer George Fetting, explores its capital city Havana. The time capsule that Cuba has been frozen in for 50 years is about to thaw. Thanks to the US and Obama administration opening up trade and softening sanctions, Cuba is set to undergo some major changes in the next few years. So before big business begins, I travelled to Havana to capture the city in all its delightfully dated glory. 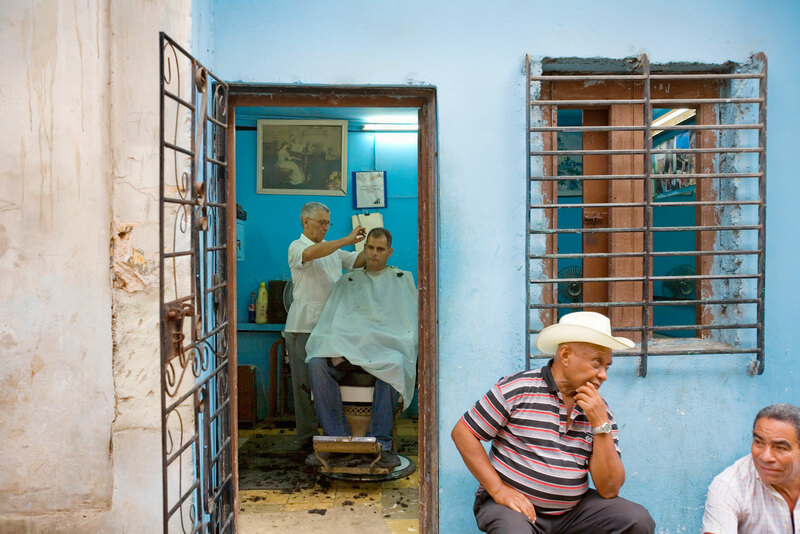 Havana is photographer’s dream, devoid of street advertising and junk food chains. No billboards, hoardings and large multi-national trademarks – at times, it’s eerily similar to 1950s USA. I have mixed feeling about the impending ‘progress’ and how irrevocably things will change when sanctions are finally lifted. 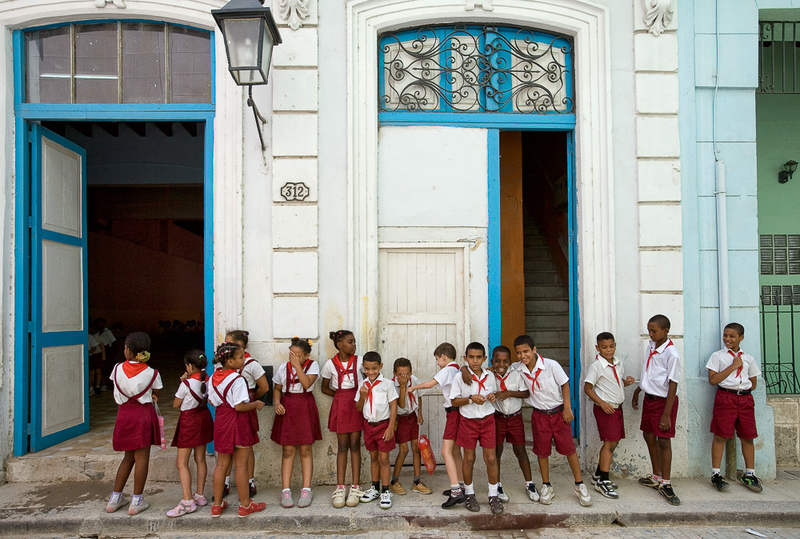 Havana possesses a dilapidated splendour that must be preserved, not painted over.